This Sunday is Mother's Day!!! 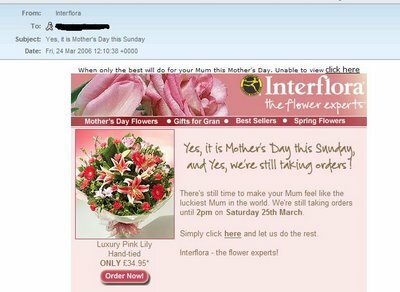 I once sent flowers to someone in the UK and I've been on this mailing list ever since. But fortunately I have a couple extra months to send flowers to my Mom since we're both here in the USA! Flowers are funny-- they are really kind of a waste of money when you think about it, but I do like sending them, and receiving them, at least when they're nice! The most beautiful flowers I ever got were from Zeze Florist in New York, as an apology for when someone mistakenly put my phone number in a book ad and I had thousands of voicemails the next day... it was a memorable experience all around! Dang, I saw the headline on pfblogs.org and you scared the crap out of me! Jeez, my heart is still pounding. I screamed all the way down the hall and asked my daughter to bring me my palm pilot to check for reminder malfunction, then my brain immediately began to calculate the cost of a non-budgeted gift and overnight shipping. I read the title and I was like oh fark. Wow, I thought I'd passed through some kind of time warp, LOL! I had to stop and think...it's March, not May! I mean...I need time to drop unsubtle hints to my family as to what I want! OMG - that was very scary. I was already planning a trip home to visit mom in my mind before I read the rest.